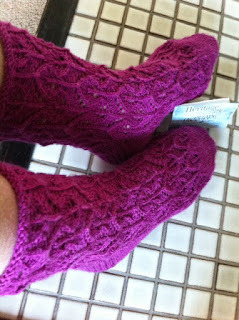 The first pair of The First Quarter Challenge made with the Heritage Silk from Cascade purchased from The Loopy Ewe. I've made them for an older relative...yes members of my family are even older than I am! I hope she'll enjoy them. So they are will be winging there way to Melbourne later today. I used the Interlocking Leaves pattern by Kelly Porpiglia from Knitty website.